It’s been weeks since the Philadelphia Eagles won their first-ever Super Bowl championship and we’re not sure the totality of the victory has fully sunken in just yet. Whether you saw your first game at Lincoln Financial Field or Franklin Field, the shared frustration of having never witnessed your team hoist the Lombardi Trophy has been bubbling over for decades. But for those of us who bleed green; our loyalty has never wavered. We teach our children the Eagles fight song. We skip family functions if they interfere with watching the game. If the Birds lose, Sunday dinner doesn’t taste as good and it takes us until Wednesday to recover. We had long hoped for a day like this, but as year after year passed by, the agony only intensified. But finally, at 10:17 p.m. on Feb. 4, our prayers were answered. We hugged family, high-fived strangers and took time to reflect on those fellow fans who were no longer here to witness the joy after so much pain. 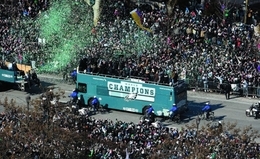 Horvitz did make it home and joined the millions of elated fans who lined the streets from South Philadelphia to the Art Museum for the chance to thank the players, coaches and front office personnel who gave us the ultimate reason to celebrate. We did it. We won. Fly, Eagles Fly. See fan photos and more in our digital edition here.